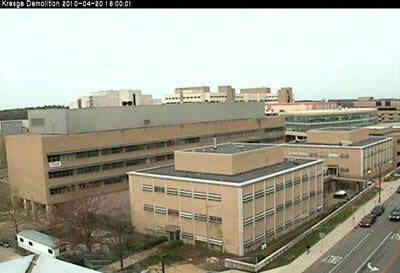 The Kresge Complex, located at the northeast corner of Ann Street and Zina Pitcher Place, was constructed primarily in the 1950s and early 1960s and includes approximately 260,000 gross square feet of space. The complex includes seven interconnected buildings: Kresge Medical Research Buildings I, II, and III, Kresge Hearing Research Institute, Kresge Temporary Animal Facility, Alice Crocker Lloyd Radiation Therapy Center, and Upjohn Center for Clinical Pharmacology. The facilities have become outdated and are at the end of their useful life. Over the last several years, the Medical School has completed several renovation projects in other buildings that allowed the occupants of the complex to be relocated. The complex is currently vacant and ready for demolition. The scope of the project will include the appropriate removal of hazardous materials including asbestos, laboratory decommissioning, disconnecting utilities, removing building foundations and associated structures, demolition of the buildings, and removal of debris. The project will also include site restoration that will provide sidewalks, landscaping and on-grade storm water management. There will be no impact on parking from this project.